St. Patrick’s Day is a feast day to honor St. Patrick, the patron saint of Ireland. However, most of us know St. Patrick’s day in the secular sense. Leprechauns, wearing green to avoid being pinched, green beer or lots of beer in general, corned beef and cabbage, shamrocks, and pots of gold are all synonymous with St. Patrick’s day. Here in the States we joke that on St. Patrick’s day everyone is Irish. In our home we usually indulge ourselves in corned beef and cabbage on March 17. I have read about making your own corned beef but I just didn’t get around to it this year. So like so many other “Irish” Americans we will probably eat that pink looking corned beef you pick up in the store for super cheap. 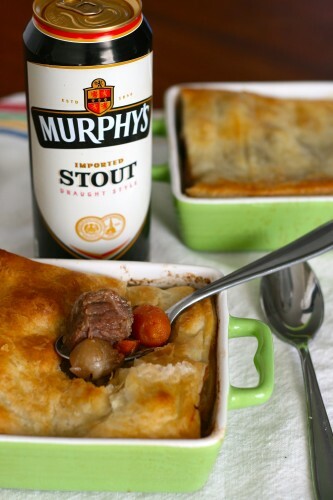 I did want to share another Irish recipe with you in hopes that you will give it a try some time soon. No reason why we should limit our Irish food to once a year. Plus if I know Mother Nature she will still throw a few more cold days our way and this will be the perfect slow cooker dinner to warm us up. I chose to make steak and ale pie and the best part is I made it in my slow cooker, then finished it off in the oven with the store bought puff pastry. This is the perfect toss it together in the morning and it will be ready to eat when you get home from work type of dinner. 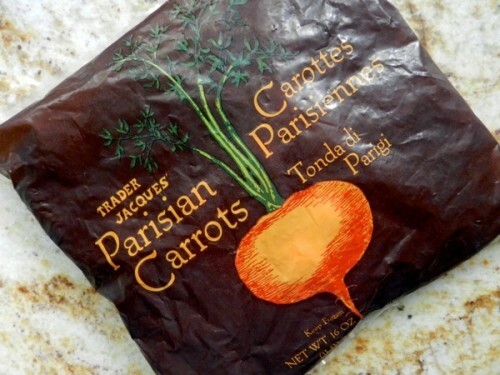 When I was grocery shopping last week I came across the cutest Parisian Carrots at Trader Joe’s. They are like little tiny carrot balls very similar in size to pearl onions, which was the next thing I grabbed. 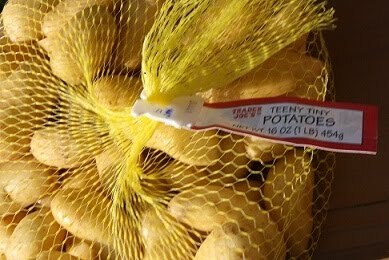 After securing tiny carrots and onions I next headed over to the produce aisle for potatoes. Would you believe my luck? There was a whole section of the cutest teeny tiny potatoes I’ve ever seen. Perfect size to cook along with my carrots and onions. Now you won’t need to go out a purchase these specific ingredients. You can just chop up regular sized potatoes, carrots, and onions to the same smaller size before you pop them in the crock pot. For my meat I used a pot roast from my brother-in-law (he’s a farmer). You could use your favorite cut of roasting meat. 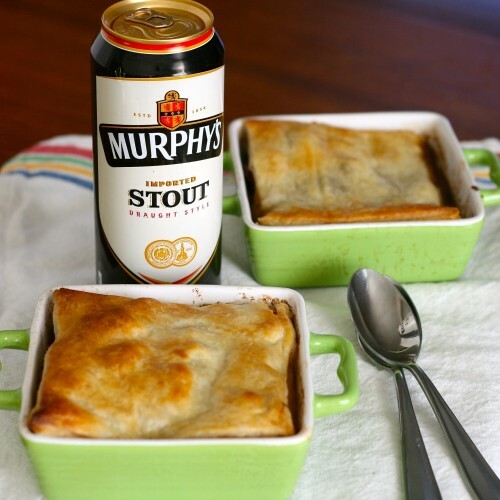 Murphy’s Stout is what I used to help flavor my stew but if you have a Guinness sitting in your fridge feel free to pour it on in. You could just eat this as a stew with some crusty bread or crackers. But I just love the flaky buttery puff pastry topper. I believe traditional steak and ale pie is served as a pie with both a top and bottom crust. If you read my last post you know I don’t have the skill to roll out a beautiful pie crust quite yet so I skipped it and took the easy route with puff pastry. 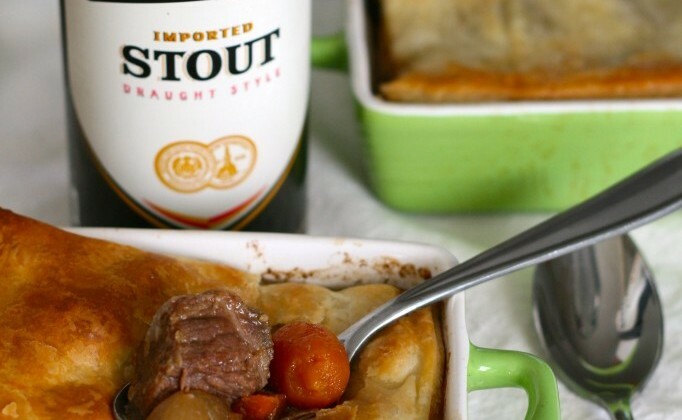 So crack open a good strong Irish stout and enjoy this steak and ale pie. May the luck of the Irish be with you! Toss together cubed beef, salt, and pepper to coat. Brown beef cubes on each side. Pour in a splash of beer or beef stock to pick up any of the browned bits that stuck to the pan. Pour into a large slow cooker. Add in carrots, onions, potatoes, mushrooms, bay leaf, thyme, stout, and beef stock to almost cover everything. Turn slow cooker on to LOW. Cover and cook for 8-10 hours. Remove bay leaf before serving. Lightly flour countertop and roll out puff pastry. Cut squares or circles to fit your bowl or ramekin. Fill bowl or ramekin with stew. Top with puff pastry. Brush with beaten egg. Bake for 10-15 minutes or until the pastry looks puffy and golden brown. Now that looks absolutely delectable! I’m so craving this now! Thank you Jocelyn! It sure is Irish comfort food. This is an awesome stew/pie! !